( Lols -but a little lazy to head back to kitchen ). luscious purple Jamun (jambul /Indian blackberries). resist myself from trying out some whacky combination..
Wow, those lil flowers made frm jamun luks amazing...used to eat a lot of jamun in my childhood days...missing them badly. Yay, so glad you're back. I actually just checked your blog recently to make sure I hadn't missed your return! lol. Hope you had a nice trip! Hi Smitha!! Welcome back!! jamun and yogurt sure is a real novel combo, the flowers look so cute!! i don't like jamuns at all but i wouldn't mind tasting that yogurt! We missed u..Hope u had a great time..! 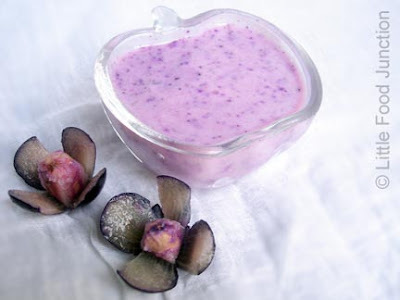 Hi Smitha, Thanks alot for ur lovely comments:).Yummy Smoothie with beautiful color. Hi smitha hope u had wonderful holiday and good to see u back.. missed all ur creations. I love the new look of ur blog dear. The smoothie looks awesome with that cute flowers. the yogurt looks delicious and so refreshing one.. nice flowers..
Glad to see u back, hope u had a great vacation, purple smoothie looks incredible and pleasant to eyes..
Lovely colour. Loved the jamun flowers too. The smoothie looks so divine . Just love the beautiful purple color n the flowers too . I need too search the markets here for jamuns. Very cute blog. I'm loving your creative play with food, especially sandwich stuff. It is fun art! Thanks for stopping by MamaMoontime so I could find YOU too! Smita, thank you for visiting my blog and leaving a comment. You have such a fun blog. Love the cute sandwiches. You put the joy in eating. You are welcome back anytime. I have placed you on my blog roll under Inspiring Blogs near the bottom of my sidebar so I don't miss a post. Thanks for letting me know you are here. You are an inspiration. smita.....yam....yam....yam....kyaa blog hai.... aur tis par kyaa design....kyaa baat.....kyaa baat.....kyaa baat.....!!lazawaab.....!! looks very pretty and yummy.